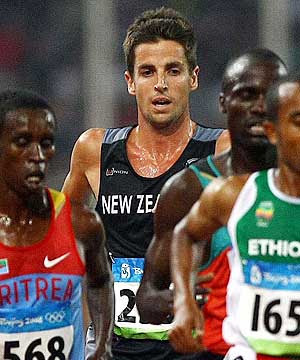 Athletics New Zealand and the New Zealand Olympic Committee are disappointed to announce Adrian Blincoe’s withdrawal from the New Zealand Olympic Team to London 2012. He was set to compete in the men’s 5000 metres. Blincoe, together with his support team, made the decision to withdraw after an injury to his ankle. The full extent of the injury is as yet unconfirmed but New Zealand Olympic Team Chief Medical Officer Lynne Coleman says it is a suspected fibula stress reaction. Blincoe is currently returning to the US where he is based and will get further medical advice and treatment. Blincoe made the following comment overnight. "Today I had to make the tough decision of having to officially withdraw from the New Zealand Olympic team due to injury. After discussions with my coaches and medical team it became apparent that I would not be able to compete at a high level at the Olympic Games. I have been dealing with an ankle injury for the past four weeks and it has greatly impacted my training and pre-Games racing schedule. The injury has been regressing in spite of constant treatment. It is now clear that trying to race with the injury, in conjunction with the training that has been missed, would not allow me to perform at the level which I would expect from myself as a member of the New Zealand Olympic Team. I wish everyone on the New Zealand Team good luck and I will be cheering for all of you." Dave Currie called the decision courageous and expressed his sympathy for the athlete. Athletics New Zealand’s High Performance Director, Scott Goodman, paid tribute to Blincoe, who has been a stalwart of New Zealand Athletics teams in recent years, having run at the Beijing Olympics, the Melbourne and Delhi Commonwealth Games and numerous World Cross Country Championships. Blincoe was a finalist in the 1500 metres at both previous Commonwealth Games and holds the New Zealand 5000m record at 13m 10.19s. “Adrian was very excited to be running for New Zealand in London and this is an immense disappointment for him. His experience at major championships will be sorely missed in the team” Goodman said.